The all-new Audi A7 Sportback will launch in Audi Athlone in late February 2018. Embodying Audi’s new design language, this stylish yet sophisticated four door coupé sets new standards in the luxury automotive sector. 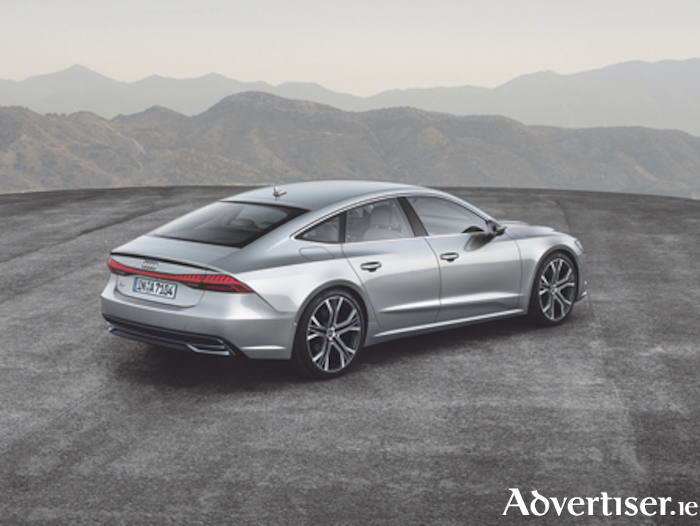 Outside, the exterior design of the new Sportback is taut and athletic looking, and showcases design dynamics and progressiveness from every perspective. The single frame grille is wider and lower than that of the Audi A8, featuring narrow headlights and boldly contoured air inlets. Inside, Audi’s reputation for building a quality cockpit continues with the A7. Its impressive futuristic features are shaped by a reduced, clean design focus. The horizontal lines and sleek instrument panel provide a feeling of airy spaciousness, and the centre console is oriented towards the driver, emphasising the car’s sporty character. All engines used in the Audi A7 Sportback come as standard with a new mild hybrid system (MHEV ) for greater comfort and efficiency. With the two V6 engines, this uses a 48-volt primary electrical system. A belt alternator starter (BAS ) works together with a lithium-ion battery and achieves a recuperation performance of up to 12kW when braking. The start-stop function has been significantly expanded and now activates at 22 km/h. In combination with the standard front camera, the engine can be restarted while at a standstill as soon as the vehicle ahead begins to move. The MHEV technology reduces fuel consumption by up to 0.7 litres per 100 kilometres. Like the all new Audi A8, the A7 too has been developed for highly automated driving. From 2018, Audi will gradually be taking piloted driving functions, such as parking pilot, garage pilot and traffic jam pilot into production. The new A7 will come with a choice of four and six cylinder engines in both petrol and diesel. The 3.0TDI 231HP is expected to be the most popular variant. The new A7 Sportback will launch in Audi Athlone late February, 2018. For more details contact Audi Athlone on (090 ) 6403900.